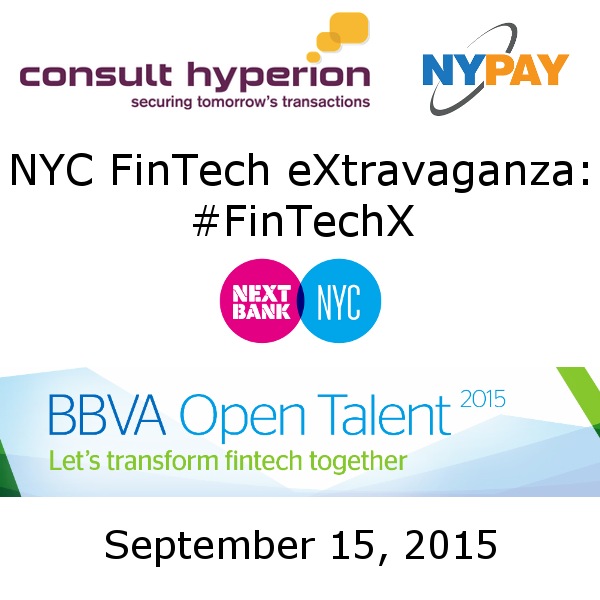 NEW YORK, New York – August 13, 2015 – On September 15, 2015, four leading organizations in the world of Financial Technology will present a day of impactful keynotes, deep-dive discussions as well as twenty Fin Tech Startup demos competing as part of the BBVA Open Talent competition. The day will be kicked off with an opening keynote from Jordan Lampe of Dwolla, followed by the first set of Open Talent demos and the Unconference session. The morning will close with a fireside chat, featuring Josh Reich, CEO of Simple, Jay Reinemann, Executive Director of BBVA Ventures and Matt Harris, Managing Director of Bain Capital Ventures. Following lunch, the afternoon will feature the second sessions of Open Talent Demos and the NYPAY Unconference, followed by a panel discussion based on the day’s discussions. The event will conclude with the presentation of the two grand prize awards for the BBVA Open Talent competition. Registration for the event costs only $50. For more information, or to register, visit www.nypay.org/fintechx. BBVA Open Talent is an international competition aimed at entrepreneurs and startups to support the development of innovative technology-based projects. Committed to innovation, BBVA has been partnering with entrepreneurs for over seven years and has a passion for discovering and promoting talent from whom they can learn and share knowledge. BBVA is looking for innovative fintech projects, but also related ideas that contribute to the industry’s evolution and transformation, such as Big Data, security, e-commerce and others. With 650 startups from 60 countries competing for the 180,000 euro prize money as well as other business opportunities, the 2015 edition of BBVA Open Talent is by far their most ambitious and mature competition to date. 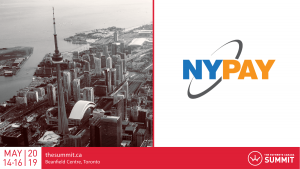 NYPAY is New York’s leading forum for innovators and leaders in payments and mobile commerce. Since 2006 NYPAY has been hosting events that replicate the best parts of multi-day conferences: the ad-hoc conversations with interesting people you do not meet during your daily routine. To do this we connect innovators and leader from the payments industry and all it touches: issuers, merchants, networks, startups, regulators, and others. Events this year included blockchain regulation, real-time payments and APIs in FinTech. Find out more at NYPAY.org. or follow us on Twitter at @NYPAYGROUP, or contact David True, President at [email protected] or (801) 613-0366. We are an independent consultancy with no off-the-shelf products, nor do we sell or promote any third-party solutions, partner or form strategic relationships with third-party vendors. Everything that we do is grounded in real problems that we can provide real solutions for and we have been intimately involved with the development of technology we use every single day. The broad spectrum of projects we have been involved with has allowed us to hold a key position at the forefront of innovation and the future of transactions technology, identity and payments. All of this means that we have become globally recognized as thought leaders and experts in the areas of mobile, identity, contactless and NFC payments, EMV and ticketing. Our clients consistently praise us for being flexible, responsive, trusted, technical experts and thought leaders. Next Bank is an independent, open and collaborative community driving change for the better in financial services through design, innovation and entrepreneurship. With around 20 conferences all around the world, from Santiago to Sydney, Next Bank creates creative, inspiring events focusing on money, finance, banking, fintech and how they’re evolving. Next Bank also runs a strong global community of members and a city based chapter network, with 40 Next Bank city chapters due to launch this year. Find out more at NextBank.org. For more information, please contact Rob Findlay at [email protected], or follow us on Twitter at @NextBank.